There are times in the early spring when the Speed River lives up to its name but, for most of the year, it is anything but speedy. Dams along the river enhance its tranquil nature. In Riverside Park, a footbridge crosses the river just near one of the dams. 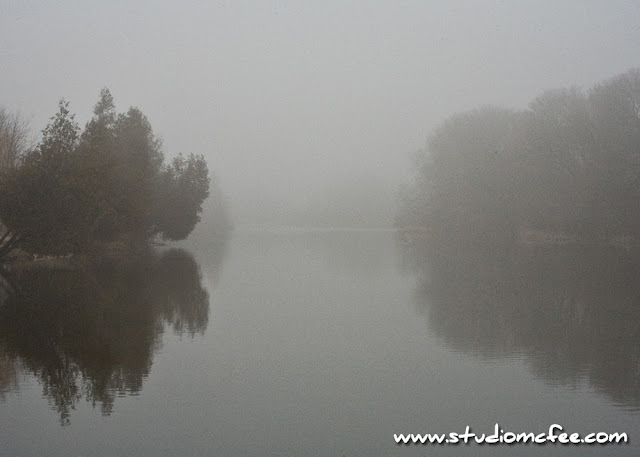 The view from that bridge, on a foggy day without wind, shows a decidedly peaceful Speed River. Guelph is a splendid city with intriguing architecture (see The Church on the Hill), a well-respected university (University of Guelph), a vibrant arts community, and one of the best music club / restaurants in Ontario (Manhattans), If you have not been to Guelph, it is a place you should consider visiting. Speed River Fog is another of my 'Nature in the City' photos. You might also like Sunset Silhouettes, Sunset in the City, and Solitude in the City.